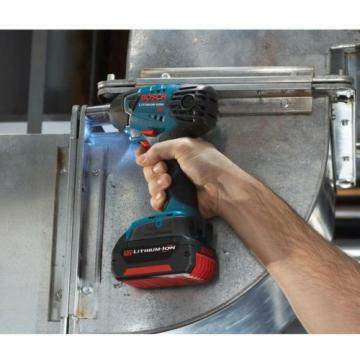 The Bosch 18-Volt lithium-ion line of Impact Wrenches use the industry's most advanced lithium-ion technology for greater battery life and more run time, all in a lighter package. 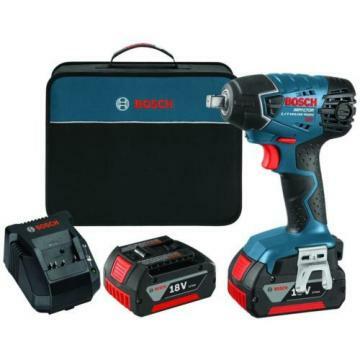 The New Bosch 24618-01 1/2 in. 18-Volt lithium-ion Impact Wrench, Up to 25% Lighter - 25% (1.5 lbs.) Lighter than MW V18 Impact Wrench, Most Compact, 23% Shorter - 23% (1.9 in.) shorter than MW V18 Impact Wrench. The most compact design in the market. SpecificationsDimensionsDrive Size (in. )0.5Product Depth (in. )13.75Product Height (in. )4Product Width (in. )11.15DetailsAmperage (amps)0Batteries IncludedYesBattery Amp Hours4.0Battery Power TypeLithium IonBattery Size18-volt,Lithium IonCharger IncludedYesColor FamilyBlueCordless Tool TypeImpact DriverCordless/ CordedCordlessImpacts Per Minute3200Maximum Speed (rpm)2800Number of Batteries Included2Power Tool FeaturesCase Included,LED Light,Variable SpeedProduct Weight (lb. )7.84 lbReconditionedNoReturnable30-DayTools Product TypePower ToolTorque (lb-in)1600Variable SpeedYesVoltage (volts)18Warranty / CertificationsCertifications and Listings1-UL Listed,CSA CertifiedManufacturer WarrantyLimited 1 Year, 3 Years with ProVantage .